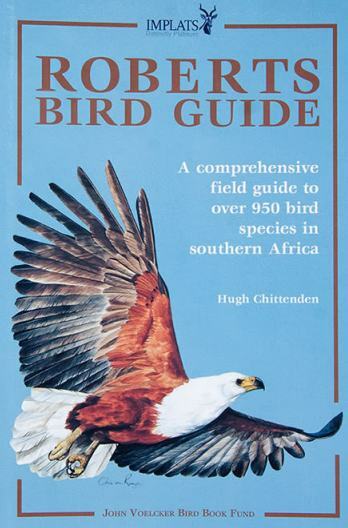 The Robert's Field Guide is not a supplement to the Roberts VII handbook, but rather has its origin in the core mission of the John Voelcker Bird book fund - which is to make bird books accessible and affordable to all, and at the price of just R175-00 for a book like this, the Trust has clearly been very successful with this project. The book is attractive, with a rugged looking vinyl cover and rounded corners, and is slimmer than the Sasol field guide - intended to fit into most jacket pockets. The illustrations are attractive, bright and large. Because the illustrations are the work of several different artists, the style varies somewhat - and so does the standard, with some excellent plates and a few odd-looking birds. Overall, despite some misgivings about the shape and posture of some of the Robert's VII illustrations, the plates in this guide are generally more satisfactory than those in the Roberts VII handbook, both through re-organisation of the plates, and the addition of plenty of new artwork, particularly of flying raptors; as well as female and non-breeding plumages for groups like widows, weavers and sunbirds. Navigation is simplified by putting the birds name with the bird itself, rather than using a numbering key on each page. The plates are liberally labelled with text notes to point out key diagnostic features and even interesting facts about plumage (such as feather tracts used in displays, or information about the tertials of some crane species - something which puzzles many birders!). Neither the emphasis, style nor content of these text notes on the plate is the same as that in Sasol and birders using both guides will find that the Roberts Bird Guide often highlights or emphasises different features from that of Sasol. Unlike other local guides, this one uses almost all of available page space, and presents a lot more information on each species than other guides. Most usefully, juvenile and female plumages are consistently described throughout, and breeding information is provided for species breeding in the region. Additional information for breeding birds is also presented in graphical form through a "breeding bar" which shows graphically the seasonality of breeding. 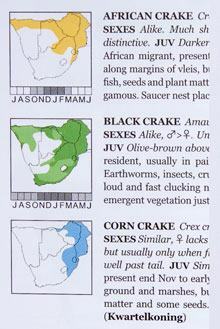 Additional information is provided on regional variations (sub-species) where this is useful. A further handy feature is the use of coloured fonts for endangered (red) and endemic (green) species. 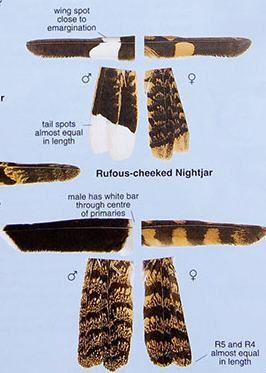 At a glance one can see which of the birds on a particular page are endemic or are classified as threatened/endangered. The book allocates substantial space to the issue of the Etymology (meaning of names) and these are presented in a user friendly index, which also includes other language indexes for 13 different languages, something that was sorely missed in Roberts VII. Afrikaans names are included in the main text and an Afrikaans edition is apparently also on its way soon. Another features of the book are the "in the hand" keys for Warblers and Nightjars - the latter of particular value to casual birders. As is the norm with these fieldguides, there is a graphical quick index on the inner front cover. The book follows roughly the same order as Roberts VII, and is thus a pity that a colour-coded index on the spine of the book is not provided for. One of the highlights of this book is the colour-coded distribution maps - which use different colours to indicate breeding and non-breeding migrants, vagrancy and abundance in different regions. Data from the two Mozambique bird atlases has also been included (not completely uncritically) and these are undoubtedly the best distribution maps currently available for Southern African birds. Average weights, food and size differences between males and females is also consistently covered - information which is mostly absent in other guides. Unsurprisingly the book has it's gremlins, and while one hopes that there are not too many of these, the mixing up of distribution maps for the queleas is one which stuck out. Overall, this is a very valuable addition to the birding literature of the sub-continent. It is refreshing, challenging and user-friendly. Is it the ultimate Southern African field guide? Not yet, mainly because the illustrations could in many areas, do with improvement. Nevertherless whether you are a casual birder, or old hand, this is an essential book to have. There seem to be a surfeit of bird books in Southern Africa, so why one might ask yet another one? In reality the field guide market in this birder-rich country has been dominated by two books for over a decade- Newman's and Sasol. Both have their followers and while Sasol (by Sinclair, Hockey and Tarboton) has been the best, neither book has evolved as much over their several editions as one might have hoped. Into this somewhat stagnant context comes the new Roberts field guide, which is refreshing in it's approach and enriching in the quantity of information it contains.